In the wake of the Charleston church massacre, the mainstream media has worked overtime to redirect the Black Lives Matter movement’s focus from state violence to vigilante violence, from institutional racism to individual prejudice. Now we are witnessing the emergence of the latest liberal fad: the “Take Down the Flag” campaign, which calls for removing – and in some cases burning – the Confederate battle flag because it is a symbol of white supremacy. But this is as true for Old Glory as it is for the rebel flag. 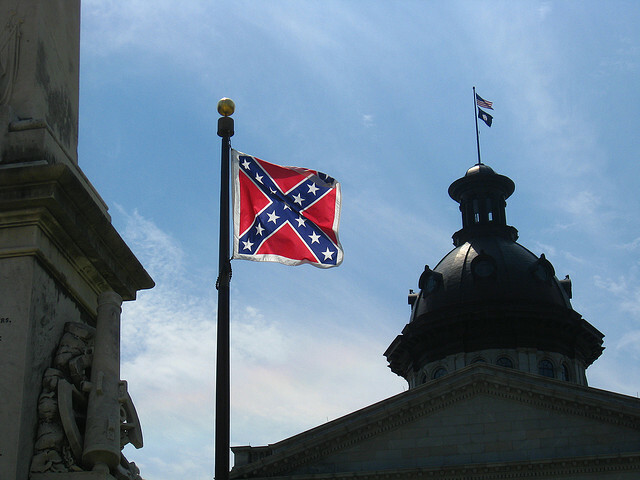 The Confederate flag was flown by a slave power from 1861 to 1865. The stars and stripes flew over a slave power from the War of Independence to the Civil War – 84 years – and has for the last 15 decades overseen Jim Crow and mass incarceration. In short, there is no horror in U.S. history over which the rebel flag presided to which the star-spangled banner has not also been a party. Consequently, there is no logical reason to ban or burn the Confederate flag that does not likewise apply to the American flag. Nor is it clear how burning the rebel flag mounts even a symbolic protest against racist violence in today’s Union. It is far easier to destroy the flag of another, long-defunct nation than it is to destroy one’s own. American liberals may as well burn the flags of apartheid-era South Africa or Rhodesia, another white-supremacist state. Within this context, the campaign against the Confederate flag is laid bare as an essentially conservative project to confine blame for racist violence to the old Confederacy, whitewash the current regime’s role in past and present racial oppression, and absolve whites outside the Deep South of racism. That this prescription for racial justice has found traction in mainstream media like the Detroit Free Press, the Chicago Tribune, and The Atlantic magazine, and has been eagerly endorsed by right-wing millionaires like Mitt Romney and Jeb Bush, should discomfit rather than reassure social justice advocates. This is not progress, but co-optation. The “Take Down the Flag” campaign is only the most obvious attempt to derail the Black Lives Matter movement’s response to the Charleston shooting. Pundits have branded the atrocity with terms like “hate crime,” “white supremacist,” and “domestic terrorism” with an enthusiasm that was never on display when the subject was police brutality. The implication is that these are separate forms of violence – that hate crimes and terrorism in defense of white supremacy can be committed by private citizens, but not agents of the state; that there is more to fear from lone neo-Confederate gunmen than the police who operate under the red, white and blue. This is a dangerous lie. In the aftermath of the Charleston murders, we must resist the mainstream media’s contention that this latest atrocity was fundamentally different from the police killings that have permeated the airwaves over the past year. We must remember that state violence and private violence have always gone hand-in-hand, protecting and reinforcing the other – that the policeman’s bullet and the lynching rope represent a continuum of legal and extralegal violence that keeps black people subjugated. And we must acknowledge that the savagery of white-power groups simply cannot compete with that of U.S. police, who are on track to kill more than 1,000 people this year. Similarly, we must reject the media’s insinuation that the victims in Charleston were somehow more innocent than those cut down by police violence, that their presence at Bible study makes them worthier victims than those who – like Michael Brown, Eric Garner, or Walter Scott – ran afoul of a legal system designed not for justice but social control. For when pundits decry the Charleston massacre as a hate crime or act of terror while downplaying police violence as mere “abuse” or “misconduct,” that devaluation of black life is exactly what is being implied. Finally, rather than arguing for objective, colorblind definitions of terrorism that include white men like Charleston shooter Dylann Roof, we must recognize that charges of terrorism have never been objective nor colorblind. On the contrary, it is an inherently racialized discourse, one designed to delegitimize the liberation struggles of people of color from South Africa to Iraq to the United States itself. Invoking the specter of terrorism against white-power militants only reinforces a national-security paradigm that harms black and brown people most of all. With the governor of South Carolina calling for the death penalty in the Charleston case, Roof seems certain to face harsh judgment. But if the state executes him while continuing to shield brutal police from accountability, it will have acted not to promote racial justice but to simply protect its own monopoly on racist violence.